I can’t believe it’s August! This summer has just flown by. Always does, doesn’t it? Anyway, I had a pretty slow week last week (yay!) so I was able to finish We Are Water by Wally Lamb and I Am Malala by Malala Yousafzai. I even had time yesterday to draft up posts—coming tomorrow and Wednesday! I’m still working my way through Jurassic Park by Michael Crichton—halfway done and it holds up nearly just as well 24 years later. 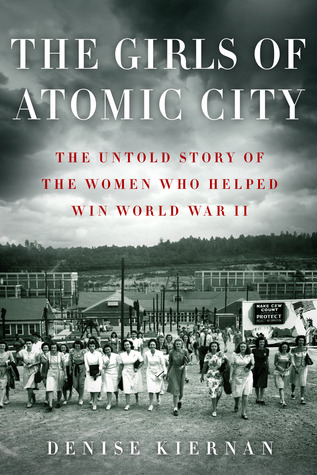 Last week I picked up The Girls of Atomic City by Denise Kiernan at the library. Our non-fiction book club is starting back up again, and this is the August pick. I’ve had this one in mind for a while now and I’m looking forward to it! I also want to read another from my TBR Pile Challenge in the next week or so, maybe A Constellation of Vital Phenomena by Anthony Marra. This entry was posted in activities, books, life and tagged book community, it's monday what are you reading by kristin @ my little heart melodies. Bookmark the permalink. Great list of books! I read Malala’s book for book club a while back and loved it. I also have Marra’s book on my TBR. I hope to get to that soon. Thanks! I ended up reading Malala’s young readers edition… and I think it actually worked a little better for me than the “grown-up” version. It was very much in her voice. Anyway, I’ll take a look over at your list! Wow, looks really great and creepy! I hope you’re enjoying it. Have a good one! I hear you on the fact that it is now August. It seems insane to me that summer is almost over. The Girls of Atomic City sounds really good. I do love nonfiction that focuses on little-known stories. Yes, me too! I’m enjoying this non-fiction bender I’m on lately. 🙂 Have a good one! I’m planning on reading I am Malala this week! Did you read both her “grown up” and young reader’s editions? I’m currently reading a book of poetry by Adrienne Rich. I only read the young readers edition, but it was great—not sure I feel like I need to read the “grown up” one since I wanted to experience HER voice rather than get a big history lesson. But I’m sure the other version is great and informative, too! I’m reading The Snow Child by Eowyn Ivey and The Promise by Robert Crais. Oooh I’ve heard good things about The Snow Child. Have a great week!